News/Events/Articles | Historic Cabarrus Association, Inc.
Come Celebrate the Holidays with us! (11/5/2018)- Come celebrate the Holidays with us! 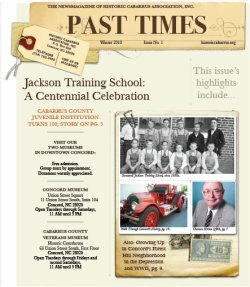 Christmas in Cabarrus takes us back in time with vintage toys from Blackwelder’s Toyland of Concord, historic images from classic Concord Christmas parades, Christmas decorations from around the county, and Christmas cards sent from Servicemen to the Concord Canteen during World War II. Annual Meeting 2017 (5/30/2017)- Please Join Us for Our Annual Meeting May 9, 2017 6:00 p.m.
A History of Healthcare on Display at the Concord Museum (5/1/2017)- On Display Now at the Concord Museum A History of Healthcare runs through May 19th at the Concord Museum.